IK Multimedia has released AmpliTube Slash, the official Slash apps and software that let you play, practice and record with Slash's signature pedals and amplifiers on the iPhone, iPod touch, iPad and Mac /PC. All versions of AmpliTube Slash feature models of the signature gear used by Slash in the studio and for his live performances. 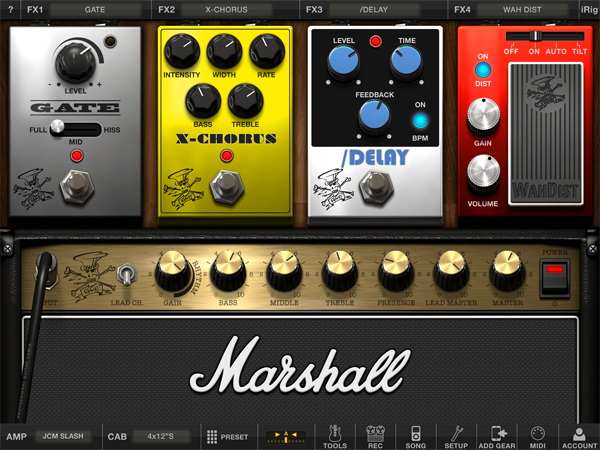 Now users can rock with models of the legendary Marshall amplifiers used by Slash together with his signature guitar pedals. Also included is a comprehensive collection of Slash's guitar tone settings provided as starting points for tone tweaking or playing along. IK worked closely with Slash to model his entire rig comprised of two must-have classic rock amplifiers – the Marshall JCM Slash Edition Silver Jubilee and the Marshall AFD100 – both equipped with Slash's favorite 1960 Marshall speaker cabinet. Together with these sought-after amplifiers users will be able to choose from six stompbox effects that includes Slash's signature Delay, Gate, Octave/Fuzz, Chorus, Booster and Wah/Distortion. The rig is fully configurable so that the signal chain can be freely customized depending upon the device used: three stompbox effects into an amp and cabinet on the iPhone/iPod touch; four stompbox effects and amp/cabinet/mic on the iPad, and up to twelve stompbox effect combinations into dual amp/cab/mic/room on the Mac/PC. AmpliTube Slash is the latest addition to the family of official IK guitar and bass products that features products with important brands in guitar effects and amplification such as Fender, Ampeg, Orange, Soldano, Seymour Duncan, T-Rex and the legendary Jimi Hendrix. Users can plug their guitar into their iPhone, iPod touch or iPad using IK's iRig guitar interface adapter or the coming soon iRig STOMP pedal interface adapter. Users with Mac/PC can connect their guitar via USB port using IK's StealthPedal digital audio interface pedal or StealthPlug cable interface that now also works with iPad using Apple Camera Connection Kit. AmpliTube Slash for iPhone and iPad are now available on the App Store at an introductory price of $9.99 / €7.99. Existing users of AmpliTube for iPhone, iPod touch or iPad can purchase AmpliTube Slash as an in-app purchase for $9.99 / €7.99, or individual models a la carte starting at $2.99 / €1.99. For Mac/PC users, AmpliTube Slash can be purchased inside AmpliTube Custom Shop for $79.99 / €59.99 (ex. Taxes), or individual models can be purchased à la carte starting from $5 each.